Castle Hill dominates the central Townsville skyline but Mount Stuart takes over that role from anywhere further up Ross River. From Mundingburra all the way up to Kelso and across the river to the university and the hospital, Mount Stuart looms large. That doesn’t mean people visit it very often, of course, but a road leading off the Charters Towers road just beyond the city winds up to a lookout beneath the radio masts. 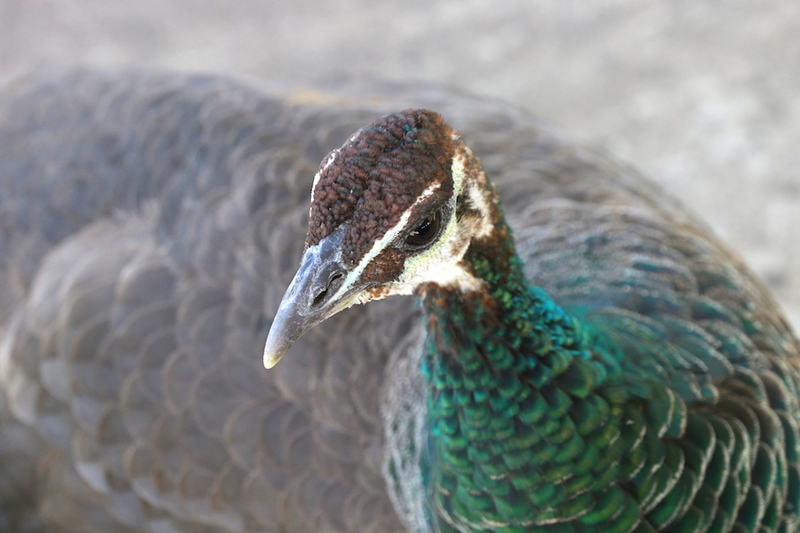 When I drove up a couple of days ago I was welcomed by a resident peacock (perhaps the same one who met me five years ago) and, after taking in the magnificent views over Magnetic Island, the Palm group and coastline all the way to Hinchinbrook, I wandered around the loop track. 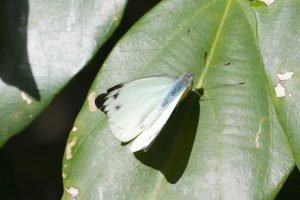 The summit is a difficult environment for plants and animals alike: very exposed, very dry, and with only a thin covering of soil where there is any soil at all. Vegetation is ‘open woodland’ with a decent covering of tussocky grass, but most of the trees are tiny. 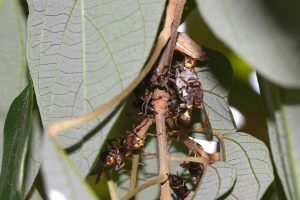 Ants seem to be the most abundant invertebrates but there were other insects to be found as well as the spiders which prey on them. * P.S. 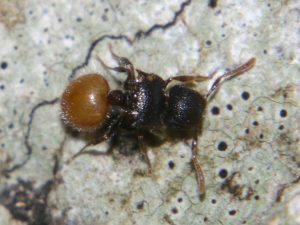 The ant has been identified by my friendly local expert as Meranoplus sp. Conditions half-way down the mountain are not quite so arid and I found more creatures per square metre than on the summit. 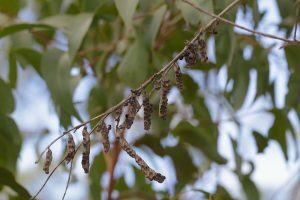 The two kinds of paper wasps are the two commonest around Townsville. More about them here and here. 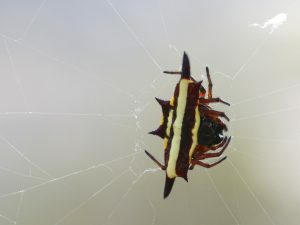 The Spiny Orb-weaver pictured, Gasteracantha fornicata, is usually seen less often than its black cousins, Gasteracantha sacerdotalis, but outnumbered them on this trip. 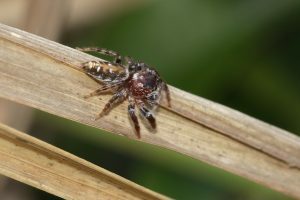 “St Andrew’s Cross spider” is a common name which is applied loosely to several similar species. 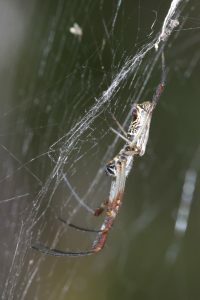 Argiope keyserlingi is the best known, A. picta is encountered from time to time, and this one may be unknown to science – which is a little bit exciting. 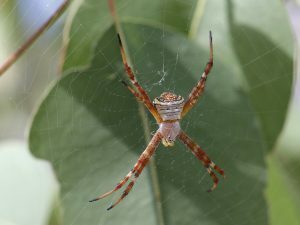 Golden Orb-weavers (Nephila sp.) are usually very big and not so brightly coloured but I have seen others around 12-15mm, like this one, in Western Queensland – at Aramac and Porcupine Gorge, for instance. 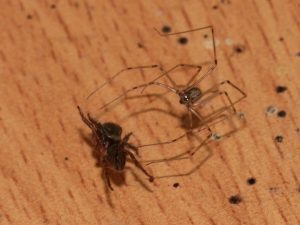 Spiders are both predators and prey and sometimes we see one in each role in the same, fatal, encounter. 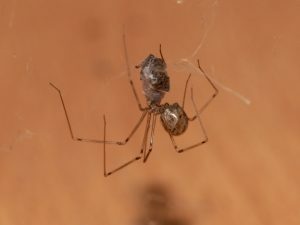 The Daddy-longlegs (Pholcus sp.) in these photos lives quietly between my computer and the wall, waiting for anything edible to come by. 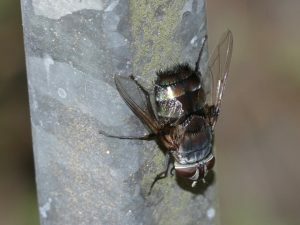 (It is probably a direct descendant of this family, since there are always a few in the area.) 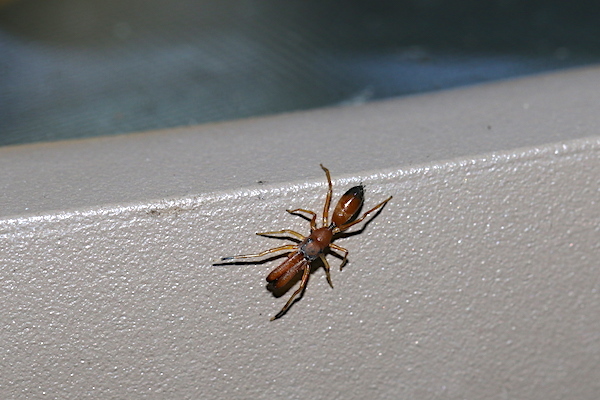 Jumping spiders, on the other hand, are roving hunters and this little brown one (I thought it might be Servaea or Simaetha sp. 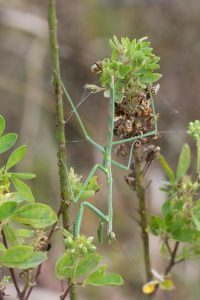 but have been reliably informed it is a juvenile Hypoblemum) was on the prowl when it blundered into a strand or two of web. That had just happened when, by pure chance, I reached around to plug in a camera lead and saw what was going on. 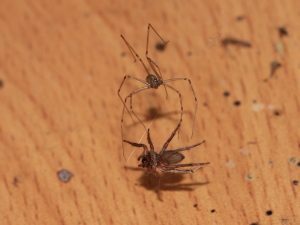 The daddy-longlegs, outweighed two to one, took care to stay at a safe distance as it used those long legs to further entrap its prey in silk. The process took a couple of minutes and the jumping spider never even looked like getting away. 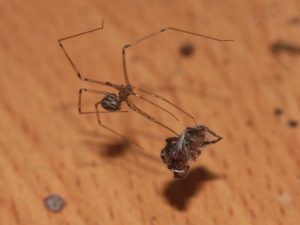 When it was secure, the daddy-longlegs finally came down to sink its fangs into its victim. Most of us, I think, automatically (and not always logically) choose sides in a conflict like this. 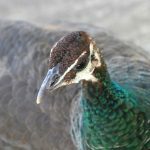 If it’s between a lion and a deer, we tend to sympathise with the deer; if a kookaburra and a snake, we’re on the bird’s side. Cat and gecko? 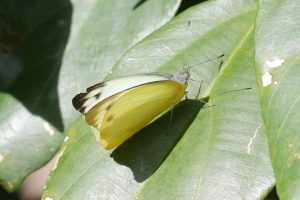 Bird and butterfly? Bird and spider? We don’t always side with the hunter, or with the hunted, or with the vertebrate against the invertebrate, or the mammal against the reptile. What do we think about spider vs spider? 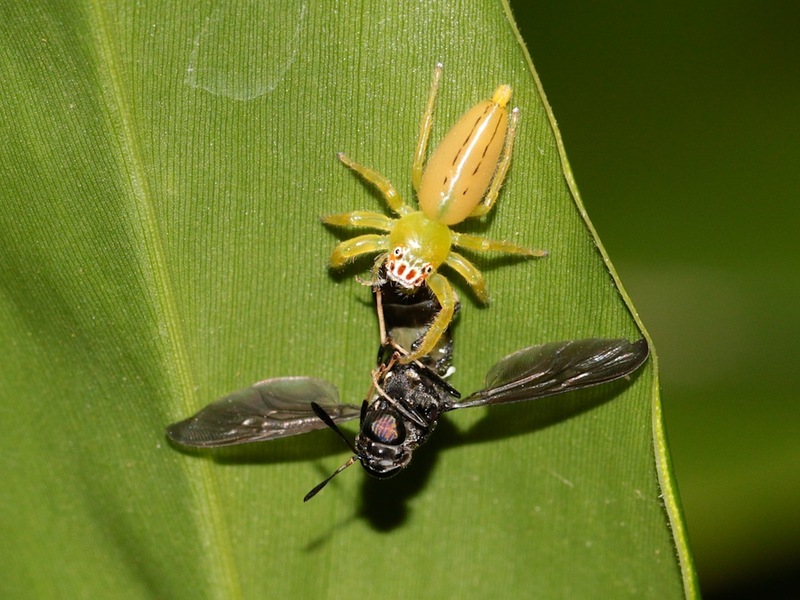 Or spider vs fly? More interestingly, perhaps, why do we think whatever we think?